Looi (middle) during a panel session expressing their views towards the e-commerce landscape in Malaysia along with (from left) Traveloka Malaysia and Singapore country manager Halif Hamzah, Zalora Malaysia marketing director Kiriat Argenio, 11street general manager of communications Judy Wong and Expedia Asia head of brand marketing for Southeast Asia Agnes Eng. KUCHING: There is growing interest in the cashback trend here in East Malaysia as can be seen in Shopback Malaysia’s rapid growth in users from Sabah and Sarawak. As the top online cashback platform, Shopback Malaysia’s co-founder Sharmeen Looi told The Borneo Post that currently, around nine per cent of its user base hails from East Malaysia. “The overall number of ShopBack users has been growing and the percentage of users from each region in Malaysia is pretty much the same over the years. “When we delve deeper, we found that data shows the number of the monthly average user from Sarawak users increases 14 per cent this year compared to 2017, Sabah is 36 per cent while Labuan has a 42 per cent increment,” she said in an email interview. ShopBack is now operating in Malaysia, Singapore, Indonesia, the Philippines, Thailand, Taiwan, and Australia with a total of over six million users in Asia Pacific. This affirmed Looi’s belief that the cashback trend is relatively mature in Taiwan and Australia as it started more than 10 years ago. To note, the cashback trend in the West started more than 30 years ago – thus Looi said would not be suitable to compare from the maturity perspective. “However, if you would to look at the growth opportunities, I am very confident that it would not be smaller than the west as Southeast Asian shoppers are found to have a higher interest in online shopping,” she enthused, adding that some Southeast Asians actually spent almost twice as much time as Americans in e-commerce marketplaces, according to a report by Google and Temasek. When asked about the new government and how their efforts are in their push and support for the digital industry, Looi believed that the digital economy remains a key growth area for the government, and collaborative efforts such as the Duty Free Trade Zone as well as focuses to enhance internet adoption via higher speeds and lower prices are positive indicators. This was part of the reason for its newest venture, ShopFest, which is the year-end shopping festival that it launched recently. It is a regional retail movement that is designed to help Asia Pacific consumers navigate the labyrinth of year-end sales and empower them in making smarter purchase decisions from September to December. “In Malaysia, it covers six major online sale events namely #MYCYBERSALE, 9.9 Rewards Day, 11.11 Single’s Day, Black Friday Cyber Monday, 12.12 Online Fever, as well as Year-End Christmas and New Year Sale. 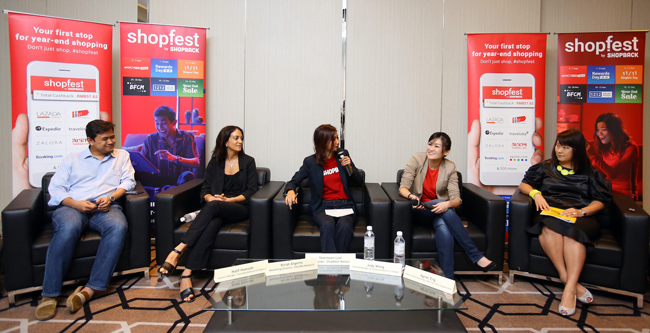 Approximately 30 leading e-retailers such as Booking.com, 11street, Lazada and Expedia will also top up for super cashback offers during ShopFest. Looi said there will be more than RM14 million worth of prizes to be won through ShopFest Treasure Chest and Ultimate Experience games. “We hope it helps to expand the online shopping community and e-commerce performance in Malaysia, and with the launch of ShopFest, we anticipate at least 70 per cent GMV growth from the same period last year,” she hoped. This festival was also encouraged by East Malaysians, Looi said, as Shopback Malaysia understood the pain points users from East Malaysia face, most notably the higher shipping cost. “With the introduction of ShopFest, our hope is to provide these users a way to keep track of all the major year-end sales events and inform them of the best ways to save. We will be giving away more than RM14 million vouchers and prizes sponsored by our partner stores from these games.